Nancy Conway | Williamson, Inc.
At the Chamber, Nancy forms relationships with numerous organizations throughout Williamson County to encourage community development. 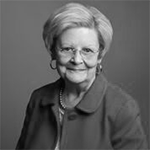 A graduate of the University of Georgia Institute of Organization Management, Nancy served as President & CEO of the former Williamson County-Franklin Chamber for 25 years, managing a growing Chamber in a fast-growing county. She is also the Past President of the Tennessee Chamber of Commerce Executives. Having lived in Franklin all her life, Nancy has a wealth of historical knowledge on the county – and tons of funny stories to tell.